There are a number of different stress reducers. They can help you reduce stress. And in turn can help in the management of your eczema. Reducing irritation, thus reducing scratching and skin inflammation. Here are some examples of ways to relieve stress. Laughter is indeed the best medicine and one of the great stress reducers. It helps lower your blood pressure, reduces your stress hormones and lets your muscles relax. We all laugh at different things. A good film, a certain comedian or just having a good chat with a friend. Even just looking at things in a different way can help you see things in a more light-hearted way. 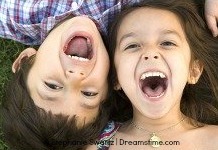 For babies and children, having fun and laughing seem to come more naturally. And their giggles are infectious. You could find your hidden child. Find fun in the smallest things and in everything you do. If it is your child who is feeling stressed spend some time doing things that they love. Watching a film or reading a book. Playing in the garden, or just having a mess about. Do anything that makes your child happy. As well as lessen their stress levels, it can help to take their mind off of their eczema. Relaxation techniques are some of the best stress reducers. 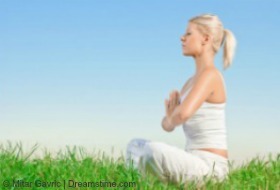 They include meditation, yoga and deep breathing exercises. There are several things you can do at home. You could use DVD's that show you basic yoga moves. CD's are also available with music to meditate to. I like to play Buddhist music. It is very relaxing and easy to listen to. It is great as background music. To meditate you need a quiet place. I close my eyes and focus on words that are important to me. I repeat them over and over. I say and feel the words. If you prefer you could go to a class. With yoga you will taught the right way to perform the moves. This will help you get the best out of it. Go for a relaxing yoga class, not a power yoga one. Power yoga is for fitness, so not so focused on relaxing. There is a good way to deep breathe too. You need to breathe deeply from your tummy. The deeper the breaths the more oxygen gets to your lungs. The oxygen helps reduce the feelings of anxiety. My knowledge of relaxation techniques is limited. So this is just a brief summary. There are other methods that are effective, so it is something to look into. Surf the web, look for local classes and read up on them. I’m sure you will find something of interest and that works for you. One great website is How To Meditate. There is lots of information on different meditation techniques, including some videos to watch. Relaxation techniques for children can be as simple as cuddling up with them or stroking their hair. For older children they could watch a film, read a book or listen to music. Though its a good idea to stay away from anything violent, loud or a bit racy! Exercising can be anything from walking, dancing, running or playing a sport. You don’t have to sweat it out at the gym! Find an activity you enjoy and find out what a great stress reducer it can be! I like playing on the Wii, especially the dancing games. I also enjoy my walk to work. Making it part of your everyday life makes it seem like it isn’t hard work. They are your brain's own way of making you feel good. There is a positive link between exercise and stress. It also helps you to sleep better. At night negative thoughts can whirl around your head, interrupting your sleep. And a lack of sleep is stressful in itself. It can make you feel tired, irritable and unmotivated. It can help take your mind off things and make you feel better about yourself. There are so many reasons for you to get your trainers on! Children may resist getting up and outside. Encourage them with something fun. 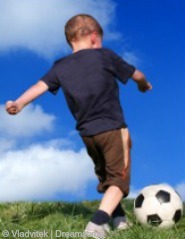 Try a hike in the woods, playing a game of football or having a family game of rounders. They always seem to enjoy things once they get started. Just remember to stay hydrated. Water is good for your skin. Also be aware of the effect of sweat on eczema. It can irritate it. So keep cool and the skin hydrated and moisturised. It is well known that getting enough sleep is important for us. Both mentally and physically. Studies show we need at least 7-8 hours sleep a night. If we are anxious we sometimes struggle to sleep. If we don’t get enough we feel even more stressed the next day. It makes us irritable and difficult to keep focused. This is why it is one of the best stress reducers. There are a few things we can do to improve our night. Don’t watch television just before you try to nod off. Especially anything violent or just plain scary! One thing I have to do is to keep a routine. It may sound a little dull but I like to go to bed at a similar time each night. If you are a parent you know that having a routine is vital for children. So if they have eczema, it is even more important. Just making sure you have some is important. Using the time you have to do the things you love. Everyone's schedule is different, but everybody should be able to find even a little time for themselves a week. So find that time and decide how you are going to spend it. Do you enjoy writing, photography, cooking or even ironing! If you love ironing I have a nice pile you could do! You could learn a new skill or join a group. Just spending time with friends and family is great. As long as they are positive people. Steer clear of people that moan constantly. Go for lunch, window shop or just people watch. There are many activities you can choose from. As long as you love doing it, it can be one of your stress reducers. These are well known stress reducers. Alternative therapies include aromatherapy, reflexology and acupuncture. As well as helping combat tension, they can also help with managing eczema. 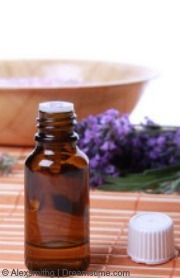 Aromatherapy is the use of oils. Certain oils are used to help make an environment relaxing. Some can also be used on the skin, either directly or added to a bath. Lavender is a good oil to use for both relaxing and for healing the skin. It can be beneficial when a few drops are added to a bath. Reflexology is to do with the rubbing of the feet. This helps to reduce stress levels as well as helping with other health issues. Acupuncture is when needles are put into certain parts of the body, depending on the health issue it is being used to improve. It is a good option when looking for something to help with tension. Though if you are not good with needles another option would be better. This is a brief description of these treatments. Most alternative therapies are suitable for children. Consultation with a doctor or a qualified practitioner is definitely recommended before starting any treatment of a child. Talking is one of the underestimated stress reducers. Just talking to your friends and family can help hugely. Sometimes just sharing your problems helps you to see them in a different light. Sometimes though, professional help, like counselling, may be needed. Especially if you are struggling to work through your problems and they are affecting your life. If you keep things bottled up you may feel more anxious. This will have a negative effect on your mind and your skin. If you are a parent and your child is feeling down, just sitting and talking to them can help. Children need reassurance and love. If they feel that they have support and that they can talk to you, that is half the battle.